April 13, 2010 - The NTSB issued a preliminary report on the experimental, amateur built Cupaiole RV-6A aircraft that crashed, N84KM, while departing Palm Beach Country Park Airport (LNA), Florida on April 3, 2010, about 12:15 PM. The amateur built aircraft was operated by a commercial pilot, Michael Cupaiole of Boynton Beach was substantially damaged during impact with a lake, following a loss of engine power while departing Palm Beach Country Park Airport. 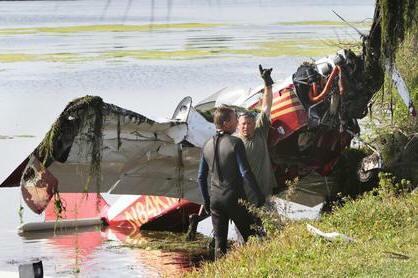 The certificated commercial pilot was killed. The personal flight was conducted under the provisions of 14 Code of Federal Regulations Part 91. Visual meteorological conditions prevailed and no flight plan was filed for the planned flight to Palm Beach County Glades Airport (PHK), Pahokee, Florida. The airplane was based at Palm Beach Country Park Airport. A Federal Aviation Administration (FAA) inspector interviewed witnesses at LNA and the pilot’s wife. According to a witness at LNA, prior to the flight, the pilot stated that he was "working on" the airplane and then planned to get fuel at PHK. The Cupaiole’s wife reported that he usually purchased fuel at PHK. The airplane subsequently departed runway 9. Shortly after takeoff, the witnesses heard the engine noise cease. The airplane then turned right and descended nose-down in to a lake, about 1/8 mile east of LNA. The airplane was recovered and brought to a hangar for examination. The FAA inspector noted that all major portions of the airplane were accounted for. Two propeller blades did not exhibit damage, while one propeller blade separated about mid-span. The airframe forward of the aft bulkhead was partially crushed. Both wings sustained impact damage and the main cabin structure was compromised. Both wings remained attached to the airplane and both exhibited compression damage to the forward spar. Both fuel tanks were compromised. The FAA inspector planned to examine the airplane’s engine at a later date. Cupaiole, age 58, held a commercial pilot certificate, with ratings for airplane single-engine land, airplane multiengine land and instrument airplane. He also held a certified flight instructor certificate, with ratings for airplane single-engine land, airplane multiengine land, and instrument airplane. ‎Cupaiole most recent FAA second-class medical certificate was issued on March 8, 2010. At that time, the pilot reported a total flight experience of 3,500 hours. The Cupaiole’s wife reported that of the 3,500 hours of total flight experience, about 600 hours were in the accident airplane. The two-seat, low-wing, fixed tricycle gear airplane, serial number 60564, was issued an FAA experimental airworthiness certificate on February 17, 2004. It was powered by a Lycoming O-320, 150-horsepower engine. According to the pilot’s wife, the airplane had accumulated about 600 total hours of operation. The reported weather at Palm Beach International Airport (PBI), at 1153, was: wind from 120 degrees at 12 knots, gusting to 17 knots; visibility 10 miles; few clouds at 2,600 feet; scattered clouds at 25,000 feet; temperature 24 degrees Celsius (C); dew point 16 degrees C; altimeter 30.09 inches of mercury.